On the Picardy coastline, the sandy beach of Cayeux-sur-Mer, 14 Km long, stretches to the Pointe du Hourdel and its small fishing port, in the north of the Somme Bay. A seaside promenade with 400 colourful beach cabins provides a pleasant place to stroll for families. The marsh of Hâble-d'Ault is home to rare species of plants and animals. 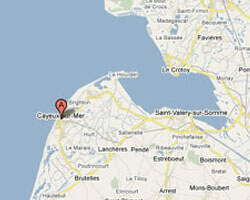 In Cayeux-sur-Mer enjoy a seaview holiday rental. The Residence enjoys an exceptional location right opposite Cayeux’s shingle beach, and within easy reach of all the local amenities. Price from 279 € to 629 €. Price from 299 € to 809 €. 2 Bedroom(s), 3 double bed(s). short stays possibility. Price from 379 € to 899 €. 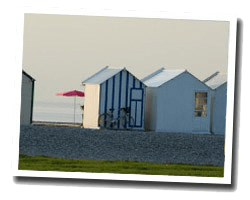 Located in Cayeux-sur-Mer, just a 10-minute drive from the Baie de la Somme, Le Sémaphore offers self-catering apartments with panoramic sea views. Le Crotoy is a 30-minute drive away. 1 Bedroom(s), 1 double bed(s). short stays possibility. Final cleaning : 37 €. Les Domaines du Hourdel offers self-catering apartments a 5-minute walk from the beach and a 10-minute drive from the medieval town of Saint-Valery-sur-Somme. Each apartment has access to the courtyard with BBQ facilities and garden furniture. 3 Bedroom(s), 1 double bed(s). short stays possibility. 3 rooms Apartment 50 m2 in the "Les Terrasses de la Plage residence". Balcony. Shared heated indoor swimming pool. distance from town centre: 150 m. View of the sea. 2 Bedroom(s), 2 double bed(s). short stays possibility. Final cleaning : 100 €.